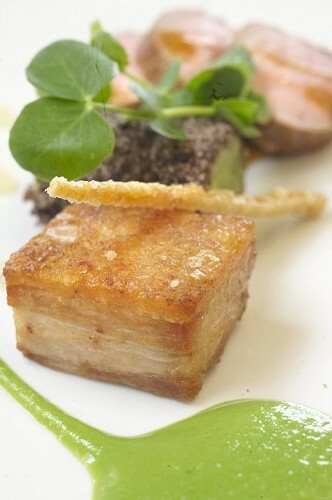 Slow cooked Gloucester Old Spot Belly of Pork and Pork Fillet, pea croquette with a black pudding crumb, pea rillette, sour apple coulis and pea salt. Recipe by: Aaron Janes, Head Chef, Silks Bistro & Champagne Bar, Atlantic Hotel, Newquay. 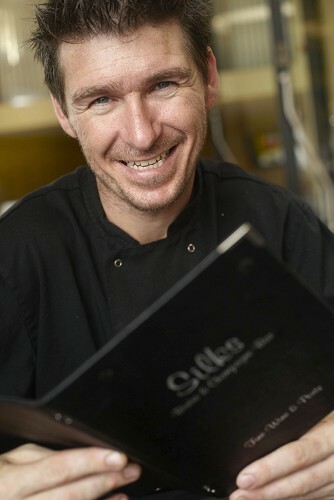 Aaron lives, breaths and dreams food, such is his passion for Silks restaurant that he helped to create back in 2004. His desire is to bring cooking in Cornwall, well and truly into the 21st century by creating classic British dishes with the very best Cornish ingredients.